On the Independence Day of 2014, Parameswaran Iyer was in Hanoi working as programme leader and lead water and sanitation specialist for the World Bank. He was involved in tackling a desperate scenario of high open defecation (21 percent) and lack of sanitation, which had led to a stunting in a burgeoning number of children in the northern mountains and central highlands of Vietnam. It was the country’s poor pocket – people were mired in a vicious cycle of poverty, low sanitation coverage and stunting. Open defecation was more prevalent among the ethnic minorities – about 31 percent – and so was the poverty and stunting. The region had become known for its stunted children. Womenfolk had started worrying about this, says Iyer, for their children would have to live all their lives with the stigma. Iyer, who had supervised World Bank sanitation projects in Egypt and Lebanon while based in Washington DC, recognised them as an instrument of change. They had understood that the basic cause of poor growth in their children was open defecation, which resulted in frequent bouts of cholera and diarrhoea. 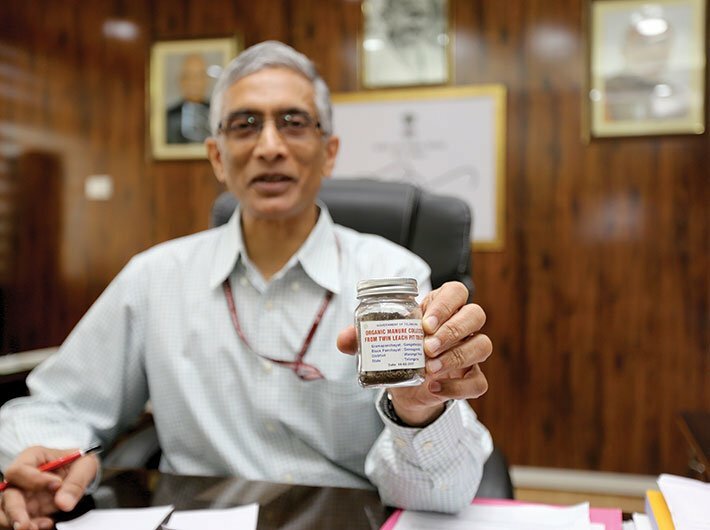 Iyer impressed upon them that these diseases were largely caused by bacteria in faecal matter that would seep into the water and soil and also spread spores through the air. It was also explained to them that frequent infections corroded the nutrient-absorbing spikes inside the children’s intestines, leaving them undernourished and hence stunted. All good work, and challenging too. But Iyer says that, watching TV, he suddenly felt homesick when he saw prime minister Narendra Modi address the nation. “I told myself I need to be back,” he recalls. The prime minister set October 2, 2019, the 150th birth anniversary of Mahatma Gandhi, as the deadline for having a clean India. Iyer sensed that political backing for such a project at such a high level was unprecedented. “It’s a phenomenal jump in the policy of achieving a clean India,” he says. Two years later, Iyer was back in Delhi as secretary, union ministry of drinking water and sanitation, and made cross-ministerial coordinator of the Swachh Bharat Mission (SBM). This coincided with 15 years of his quitting the IAS to take up the World Bank job in the US. The prime minister couldn’t perhaps have hand-picked a better person to head his pet mission. When Iyer joined in mid-2016, the SBM campaign was not making headway beyond construction of toilets. In fact, right from its launch on October 2, 2014, the SBM neither had a robust mechanism to make sanitation self-sustaining nor a follow-up system. In fact, Iyer was appointed by setting aside rules and normal procedures, which might have caused heartburn in some sections of the bureaucracy. His entry on the Swachh scene was supposed to energise the mission and make bring India’s efforts at universal sanitation on a par with global standards. Given India’s diversity, large population base and social complexities, the work, even for Iyer, was a tall order. Sitting in his office in the only green-painted building in the capital’s central government offices (CGO) complex, Iyer measures progress every minute. On the day Governance Now met him in his office, he had made 2,11,243 of India’s approximately 6.4 lakh villages open defecation free (ODF); it was his 516th day at work and he had 220 days left to finish the work. All these figures are scribbled in black on a whiteboard in his large office. It’s updated daily; sometimes, more than once daily. It happened to be a Saturday, and it took some explaining at the security desk manned by CISF personnel, for they wondered why a senior official would be working on an off-day. But in the visitors’ room in Iyer’s office, an aide offered that the boss would love to work even on Sundays – only, the staff put their foot down! “I measure every day what is my contribution to the programme,” says Iyer, who may not be a man in a hurry but clearly knows it’s a race against time. The campaign, he says, is showing results: already from 39 percent in 2014, the toilet coverage across India has gone up to 67 percent. So far, under this flagship scheme, 2.10 lakh toilets have been built across 150 districts. Five states – Sikkim, Kerala, Himachal Pradesh, Uttarakhand and Haryana have become free of open defecation. He clarifies that these figures pertain to the rural (gramin) segment, indeed the most challenging segment of SBM. “We will complete the mission well before the deadline,” says the man in the hot seat, in a steely tone. What has turned this otherwise ‘sarkari’ scheme into a ‘jan andolan’ (public campaign), he says, is prime minister Modi’s commitment to it. He never forgets to mention about this mission in his radio talk ‘Mann ki Baat’, which in turn helps generate awareness and seriousness about the mission among people. “I always say it is a PM-CM-DM scheme, driven by the political will of the prime minister, with plans of action made by chief ministers, and implementation by district magistrates,” says Iyer. For him, the SBM team comprises collectors, NGOs, anganwari workers; and of course, the prime minister remains the team leader. His next target is to make 300 more villages ODF by the year-end and give toilet coverage to ten more districts by mid-March. Iyer’s experience at the World Bank has taught him that building toilets is easier than changing peoples’ habits and making them embrace sanitation as a way of life. “Villagers have to understand they have stakes in using toilets and ending open defecation. In India, about one lakh children die of diarrhoea per year and six percent of the GDP is spent on combating preventable filth-related diseases. Besides, it brings indignity to the womenfolk, rarely spoken of among the men, who hold the family purse strings and are not interested in building toilets in houses,” he says. Iyer says that, with no dearth of funds for the mission, toilet building is going apace across most of the states, except the three big ones: UP, Bihar and Odisha still need more support. Right now, the focus of the SBM is on the use of correct technology – twin leach pits which could be used alternately. When one pit gets filled, the family can leave it to dry and use the other one. In the meanwhile, the faecal slurry gets converted into manure which can be used in fields. Being a hands-on leader, Iyer had cleansed a dried soak pit in Warangal, Telangana, in full public view and lifted the manure by hand. The subtle message from Iyer lifting decomposed human excreta by hand was not lost on the onlookers in the south Indian city, where onlookers would have known from his surname that he was a brahmin. Iyer, too, is aware of breaking the shackle linking particular groups with human waste disposal. In fact, he has kept a bottle of manure made from human waste as a memento on his table. “This is gold, I tell the people,” he says, showing off the tiny bottle. His focus is now on catching the imagination of people and getting them to use toilets: social campaigns like the ‘darwaza bandh’ campaign, featuring superstar Amitabh Bachchan, are already lighting up TV screens across the country. Now, he is working out a strategy to keep the momentum going on cleanliness once the toilets are built in all homes. “The renewed focus is to make ODF sustainable,” he declares. Building toilets may happen, but ensuring their usage, verification of claims by village panchayats and the district administration about ODF status for villages and talukas needs attention. Already the villages which have turned ODF have nigrani samitis (watchdog bodies), including villagers and children as members, for effective implementation of toilet usage. In some villages of Madhya Pradesh, small groups of children who have learnt of the dangers of open defecation have taken to heckle and boo anyone found defecating in the open to shame him. The state governments have fanned 13,000 swachagrahis – villagers who volunteer to spread awareness about cleanliness for a small remuneration. In the long run, all villages have a swachhagrahi each, whose job it would be to talk to people and get them to use, and keep using, toilets. He is also working on a system of a third-party verification of the ODF status and its sustainability as is the norm globally. Iyer has several ideas. He believes a swachhata ranking of villages will go a long way in making people feel proud of their surroundings and hence sustaining it. Already, 1,40,000 villages have done self-ranking assessment, which is subject to verification. Although a National Sample Survey Organisation (NSSO) has found the high usage of freshly built toilets, Iyer and his team are eagerly awaiting the next NSSO survey, which would give the big picture of SBM’s impact on the ground. At the global level, one wonders why a small nation like Bangladesh has been able to nearly eradicate open defecation without providing incentives for toilet-building. Iyer says Bangladesh is a different case. There, the focus is not on proper technology, and the toilets there are mainly single pit or makeshift, which leaves them with the need to dispose of the faecal slurry. “Invariably this will be thrown off in a stream or on the roadside.” This, he says, is no solution for sanitation. Besides, he says, Bangladesh took 15 years to end defecation in the open while India is trying to achieve it in just five years; that too, on a much bigger scale. Iyer is pleasantly surprised at the response of private companies and philanthropy institutions to the campaign. The Swachh Bharat Kosh (SMK), a fund created for citizens and businesses to donate to the campaign, has already received Rs 550 crore. Kerala’s spiritual leader Mata Amritanandamayi was the first to donate a whopping Rs 100 crore. The Tata Trust has deployed 600 highly qualified graduates at district level to assist the district collectors with the ODF drive. These highly motivated volunteers are called zila swachh Bharat preraks and they are paid by the Tata Trust. It’s a big dream, but the man driving it dreams big too. And it relates to a larger goal for Iyer. Half of India’s below-five-year-olds are malnourished and stunted. The situation is worse than in the poorer sub-Saharan countries. Iyer hopes to change this, and relates it to the work he had undertaken in Vietnam, from which he came straight to India in response to an inner urge.